A stand of Tall Pines are depicted on this Pine Tree Lantern Pendant Light. This nature inspired pendant light is finished in Antique Copper and has Frosted art glass panels. Made in the USA. 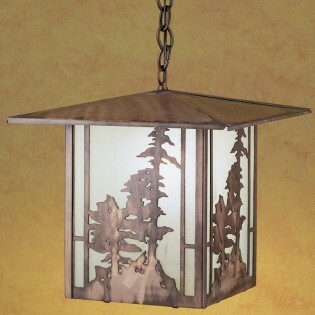 A stand of Tall Pines are depicted on this Pine Tree Lantern Pendant Light. This nature inspired pendant light is finished in Antique Copper and has Frosted art glass panels.